Peter Pipe gave a stirring and informative demo on spindle turning in the Jan meeting (Jan 11, 2011). Peter always gives us a good glimpse into his world of fun with turning. 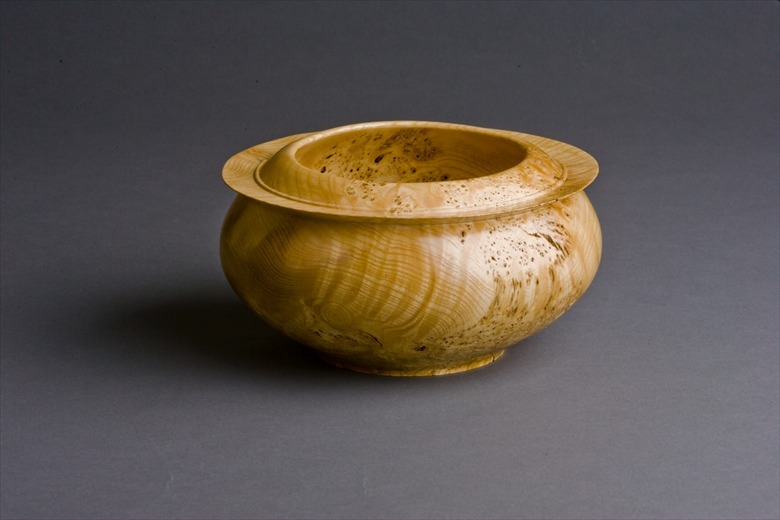 His focus was on spindle turning with a rounded Skew. His display of the 3 basic cuts using the skew made it look easy of course. Basic instruction: set the toolrest above center, and with the handle down, ride the bevel. Raise the handle to engage the wood at a point about 30% from the bottom of the cutting blade. Turn into the wood, while raising the handle further. Several had a chance to try it out and see how practical it is. Using this kind of cut is like wood planning so the cuts can be quite smooth. It is a good practice to master. Peter had a handout for those attending, so send him an email if you want one. There were a number of folks who brought items to the meeting for presentation. Pres Challenge was a turned toy, covered nicely by Richard Winslow's small cars, Ed Howe's top which he donated to Peter for the kids, George Lutz and his version of the ball and cup toy, Bud Trapp with a top spun with a string, and of course Peter with a myriad of tops and string things. Show and Tell gave Tom Haines a chance to show a inlaid clock design, Harvey and a small (of course) finial ornament, Bob Tang and several natural edge bowls and a do-everything bowl (ask him to describe to you), and Bud with a small bowl that dried and took an interesting shape. The next meeting will be at Los Altos (I will send out a reminder) on Feb 8th at the usual time of 7PM, and will include a unique agenda. First of all the President's Challenge will be turned jewelry. Secondly the main agenda item will be a panel discussing wood that is a challenge to turn. They will decide what best to do about it. It is a unique opportunity to hear from the immense experience we have in our club. More details to follow. The newly formed Program Committee is off and running, having had their first brain storming session. Do see this page to add your comments and suggestions. Claude will head this committee comprised of Grant Allison, Curtis Vose, Laura Mulligan, and Tom Haines. Their charter is to come up with ideas for future meetings, and they are off to a good start. We can hope for a report soon on a range of ideas for feedback. Already there is a request for input. See the request for comments on our homepage. For a job well done and done with a lot of time and effort on both of their parts. Their leadership and contribution are worth much appreciation. Demo in March, see homepage for details as they occur. Also keep your eyes open for some wood for this is the time of year when the trees come down. Hats off to Cecil and Ron for the recent collection of freshly fallen trees. His contribution of some wood at the meeting with Ron was well appreciated. Keep your eyes open and let them know if there is wood out there. Dues for 2011 are now due. Late fees will be charged if the check was not received by Ken before the next meeting. New annual dues are $30, so please act now or pay the late charge. It is important to be counted and to contribute, for the activities in the club depend on these funds. There are also good reasons to join AAW. See our website for details and a link to AAW.